SVG is all the new rage. I’ve written about why you might want to use SVG images here and also a variety of ways to implement them on web pages here. But if you’re using WordPress, there are a few things you can do to make using SVGs within the WP-Admin area easier. 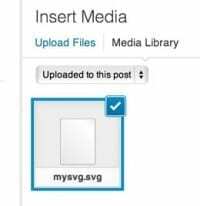 Voila, you can now upload SVG files via the Media Uploader. Unfortunately, right now it’s not very easy to add actual SVG code (vs. the image file itself) to a WordPress post. I’ll update this post when and if I figure out how to do that, but for now, one not-so-elegant solution is to upload an HTML file of the code and then insert that as an iframe. It takes a ton of time for me to put this stuff together, and I offer it completely free. That said, I’d really appreciate the +1 love. Thanks great post. I also found this post http://blog.teamtreehouse.com/perfect-wordpress-inline-svg-workflow that uses a simple WordPress hack and the function get_template_part() to create an inline SVG. Very helpful article! How did you manage to use svg files with SSL cert on your website. My WordPress install says that my svg files are insecure. Maybe your SVGs have embedded files that are being served from non-secure locales? I haven’t had this problem with straight up SVG files.